(Vatican Radio) At the morning mass at Santa Marta, Pope Francis underlined the feast of the Dedication of the Lateran Basilica, which the Church celebrates on Saturday. The Pope recalled how the feast day is also the feast of the city of Rome, the Church of Rome and the Universal Church. The Lateran Basilica (or the Basilica of Saint John Lateran in Rome) is the cathedral of Rome and “Mother of all the churches urbe et orbe”. The Pope addressed the “three icons” in the day’s readings, which speak of the Church. From the first reading of Ezekiel and in Psalm 45, the icon of the river that runs from the Temple and in which the city of God rejoices is the image of the grace that sustains and nurtures the life of the Church. In the second reading of Saint Paul to the Corinthians, the icon of the rock, which is Jesus Christ, is the foundation on which the Church is built. The Gospel reading of the purification of the Temple is the icon of the reform of the Church—“Ecclesia semper reformanda”—because the members of the Church are always sinners and in need of conversion. (Vatican Radio) Pope Francis has called for the “real inclusion” in the Christian community of people with sickness and disability through inclusive ministry in parish communities and Catholic associations. The Pope made these comments in the Paul VI Hall during an audience attended by people with sickness or disability and some members of UNITALSI, an Italian association that travels with the sick and disabled on pilgrimage to Lourdes, France, and to other international Marian sanctuaries. The association is marking 110 years since its foundation. VATICAN CITY -- VATICAN CITY (AP) — Pope Francis has greeted hundreds of people in wheelchairs one-by-one — part of a special gathering in which rows of seats were removed from a Vatican auditorium to make room for the disabled visitors. Some 600 people in wheelchairs waited to have their time with Francis during the event Saturday. He moved down the rows to greet each person, doling out hugs and kisses as well as chatting. (Vatican Radio) During the Angelus in St. Peter’s Square, Pope Francis focused on Sunday’s Gospel reading, in which Jesus tackled the Sadducees, those who denied that there could be a resurrection. The Sadducees, Pope Francis said, put the following question to Jesus, in an attempt to ridicule the belief in resurrection: “A woman has had seven husbands, who died one after the other. Now at the resurrection, whose wife will that woman be?” First of all, the Pope said, Jesus explains that life after death has different parameters from our life on earth: eternal life is a different life, in a different dimension where, among other things, matrimony will no longer exist. The risen, Jesus says, will be like angels, and they will live in a different state of being, which we cannot achieve or even imagine right now. (Vatican Radio) Pope Francis has sent a telegram of condolence to the President of the Philippines, expressing his solidarity with those affected by Typhoon Haiyan. The typhoon, one of the worst on record, is feared to have killed as many as 10.000 people on Leyte island, which bore the brunt of the storm. Please find below the full text of the telegram, signed by Archbishop Pietro Parolin, Vatican Secretary of State. Pope Francis also prayed for the victims of the typhoon after the Sunday Angelus in St Peter’s Square. He firstly called for silent prayer, and then led the faithful in a recitation of the Hail Mary. Furthermore, he urged those present to help their brothers and sisters in the Philippines concretely, as well as through prayer. grace-land, the picture of the Pope cradling this man's face -- brought me to tears. What a compassionate man he is. Oh, sister, it was so moving to see his compassion for that man. The picture reminded me of Mother Theresa of Calcutta, a nun, who spent many years in the slums helping the poorest of the poor and the sick and the dying. that is exactly who I thought about too. I remember reading this story about a journalist interviewing her as she tended the lepers. The journalist was taken aback that she did not hesitate to touch them. He said, "I wouldn't do that for a million dollars." To which she kindly replied, "Neither would I." What an incredible woman she was. (Vatican Radio) Those who don’t truly repent and only pretend to be Christian are damaging the Church. These were the words of Pope Francis at Mass on Monday morning in the Vatican’s Santa Marta. Pope Francis focused his homily on the Lord’s exhortation to forgive our brothers and sisters who have sinned. Jesus, he said, never tired of forgiving, and neither should we. As the Gospel says, if our brother wrongs us seven times in one day, and repents every time, we should forgive him. However, Pope Francis warned, there is difference between being a sinner and being corrupt. Those who sin and repent, who ask for forgiveness, are humble before the Lord. But those who continue to sin, while pretending to be Christian, lead a double life, they are corrupt. A Christian who is a benefactor, Pope Francis said, who gives to the Church with one hand, but steals with the other hand from the country, from the poor, is unjust. And Jesus says: “It would be better for him if a millstone were put around his neck and he be thrown into the sea”. This is because, the Pope explained, that person is deceitful, and “where there is deceit, the Spirit of God cannot be”. “We should all call ourselves sinners”, Pope Francis said, but those who are corrupt do not understand humility. Jesus called them whitewashed tombs: they appear beautiful, from the outside, but inside they are full of dead bones and putrefaction. And a Christian who boasts about being Christian, but does not lead a Christian life, is corrupt. Baltimore, Md., Nov 11, 2013 / 09:55 am (CNA/EWTN News).- At the opening of the U.S. bishops’ autumn conference, the Pope’s representative urged the diocesan shepherds to a more profound witnessing to Christ and to preserve unity amongst themselves. This is “a call to attentiveness, watchfulness and preparedness for whatever proclaiming the Gospel may mean for us as successors of the Apostles, who were called to give radical witness to their faith in Jesus Christ,” Archbishop Carlo Vigano told the U.S. Conference of Catholic Bishops Nov. 11. The former prefect of the Congregation for the Clergy has told a traditionalist group that Pope Francis has no intention of restricting access to the Extraordinary Form of the Latin liturgy. “I met Pope Francis very recently and he told me that he has no problem with the old rite, and neither does he have any problem with lay groups and associations like yours that promote it,” Cardinal Dario Castrillon Hoyos told members of Una Voce International (FIUV), who were in Rome for a general assembly. Responding to questions from FIUV members about tensions within the Friars of the Immaculate, the Colombian cardinal said that the Pope moved to insist on the use of the Novus Ordo in that religious community only because of internal dissension, and not because of any negative judgment on the traditional liturgy. ROME (RNS) The Vatican said it would display for the first time bones believed to be the mortal remains of St. Peter, the leader of Jesus’ 12 apostles, to mark the end of the Year of Faith, Nov. 24. Fisichella was referring to the long-held belief that Peter was crucified upside down and died in either A.D. 64 or 67 on the spot now marked by the Clementine Chapel inside the basilica that bears his name. The church never officially declared the bones — which were discovered in the 1940s — authentic. But a series of exhaustive tests conducted on the bones between their discovery and 1968 convinced Pope Paul VI they had been “identified in a way we can hold to be convincing.” Previously, only the box containing the bones was on display. The U.S. Conference of Catholic Bishops (USCCB) 2013 November General Assembly in Baltimore will be held on November 11-14. You will be able to view the bishops' actions at the meeting by viewing the live stream or reviewing video-on-demand of the public sessions and reading through the tweets below. You will also find links to related USCCB news releases and coverage from Catholic News Service on this page. Links to the agenda, speeches, votes and other material are posted in the right hand column of this page. The USCCB Media Blog profiles the 2013 President/VP candidates. WASHINGTON—The U.S. Conference of Catholic Bishops (USCCB) will elect the next president and vice president of USCCB during the bishops’ annual fall General Assembly, November 11-14, at the Baltimore Waterfront Marriott Hotel. The USCCB also elected Cardinal Daniel DiNardo as its vice president. Archbishop Joseph Kurtz of Louisville, Ky., was elected Nov. 12 as the president of the U.S. Conference of Catholic Bishops. BALTIMORE — The U.S. Conference of Catholic Bishops has elected Archbishop Joseph Kurtz of Louisville, Ky., as its next president, giving national prominence to a prelate with significant experience in Catholic social services. Archbishop Kurtz, 67, has served as the conference vice president since 2010. He was elected conference president at the conference’s fall assembly in Baltimore the morning of Nov. 12. He will serve a three-year term. 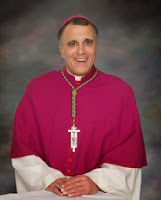 The bishops’ conference president plays a significant role in coordinating and leading charitable and social work and education, while providing a public face for the Catholic Church in the U.S.
Archbishop Kurtz served as bishop of Knoxville, Tenn., from 1999-2007. He was a priest of the Diocese of Allentown, Pa., for 27 years, with a special focus in social services, diocesan administration and parish ministry. He served as the director of the diocese’s Catholic Charities affiliate from 1988 to 1998 and was an executive director of the diocese’s Catholic Social Agency and Family Life Bureau. He is the vice chancellor of the board of the Catholic Extension Society and an adviser to the Catholic Social Workers National Association, the Archdiocese of Louisville website says. He is on the board of directors of the National Catholic Bioethics Center and on the advisory board to the cause for the canonization of Venerable Archbishop Fulton Sheen. The archbishop has previously served as chair of the U.S. bishops’ Ad Hoc Committee for the Defense of Marriage and Family Life. First cardinal from Texas. Chairman-elect of the bishops' Committee on Divine Worship. Former chairman of the Committee on Pro-Life Activities (2009-2012) and current member of that committee, as well as National Collections Committee and Subcomittee on Health Care Issues. Participated in the March 2013 conclave to elect Pope Francis. (Vatican Radio) Pope Francis reflects on the loving nature of God’s hands, saying even when scolding us, these hands never give a slap but instead a caress. This was the focus of his homily at the Tuesday morning mass at the Santa Marta Guest House. In his homily Pope Francis reflected on the reading from the Book of Wisdom that recalls how we are created from the soil by God’s hands, “those hands which have never abandoned us.” “God created man to be incorruptible,” said the Pope but the devil entered the world and those who belong to him know all about it. (Vatican Radio) Pope Francis met on Tuesday with Metropolitan Hilarion, head of the Department of External Church Relations of the Russian Orthodox Church. Later this evening a "Concert for Peace" in honor of Pope Francis, will be offered by the Russian Orthodox Church, with music sung by a young Russian opera singer, Svetlana Kasyan, at the Auditorium in Via della Conciliazione. The Pope’s meeting with Metropolitan Hilarion comes as the Archbishop of Milan, Cardinal Angelo Scola, is in Moscow, meeting with the head of the Russian Orthodox Church, Patriarch Kirill. Exploring Orthodox spirituality and promoting reconciliation between Catholics and Orthodox is also the focus of life at a Benedictine monastery in Belgium, commonly known as Chevetogne Abbey. Founded in the 1920s, the monastery holds both Latin and Eastern rite services every day and runs the world’s oldest ecumenical journal entitled ‘Irenikon’. BALTIMORE — During the first day of their fall meeting in Baltimore, the U.S. bishops discussed themes and priorities for their work as a whole, including evangelization, the family and Catholic education. The bishops also carried out a canonical episcopal consultation — a required step in the Church’s canonization process — for Mother Mary Teresa Tallon, servant of God. After hearing a presentation from Cardinal Dolan, the local prelate promoting Mother Tallon’s cause, the body of bishops approved a request to move forward on her sainthood cause. “There’s a great enthusiasm for the synod,” Cardinal Dolan observed as he opened a discussion on how to best gather data. The bishops have been asked by the Holy See to collect information on the state of marriage and family in the U.S. Church in order to help address pastoral questions of how to minister to those living in irregular family situations, among other things. While confirming that “the questionnaire is intended for the bishops,” Cardinal Dolan noted that the bishops can consult various groups and individuals in compiling their answers. Some bishops said they are seeking input from the faithful over the Internet, while others are contacting pastoral councils and other diocesan organizations to gain the data needed to prepare for the synod. ROME — Pope Francis will meet with Russian President Vladimir Putin on Nov. 25 at the Vatican, according to the director of the Holy See Press Office, Father Federico Lombardi. Pope Francis will be the third pope to meet with President Putin. On March 13, 2007, the Russian leader met with Benedict XVI; and although he did not invite Pope Benedict to visit Russia, despite hopes that he would, the meeting did mark a turning point in relations with then-Russian Orthodox Patriarch Alexis II. Blessed John Paul II met with Putin twice during his pontificate, once in 2000 and a second time in 2003. Years earlier, the soon-to-be-canonized saint met with the president of the Soviet Union, Mikhail Gorbachev, on Dec. 1, 1989, several days after the fall of the Berlin Wall. 1. Archbishop Joseph Kurtz, of Louisville, was elected president of the USCCB today. Archbishop Kurtz has been the conference's vice president for three years and you can hear how the Conference is called to follow Pope Francis' lead in warming hearts and minds. In addition, Cardinal Daniel DiNardo, of Houston, was elected as vice president. 2. Several different USCCB committee chairman were elected today, and you can see the full list. Vatican City - History will show that the Vatican's controversial ex-number two man was “generous and faithful” in his work for the Holy See, Pope Francis has said in a book presented Tuesday. Cardinal Tarcisio Bertone, who held the influential post equivalent to the Vatican's prime minister, presented his book on “Vatican Diplomacy in a Globalised World” to journalists a month after stepping down. In the preface, Francis defends the actions of his predecessor pope Benedict XVI's right-hand man - a divisive figure appointed in 2006 who was disliked by many for his management style. “History... will make clear the intense work done by Cardinal Bertone,” who gave “generous and faithful support” to Benedict's papacy, Francis wrote. Page created in 6.259 seconds with 19 queries.